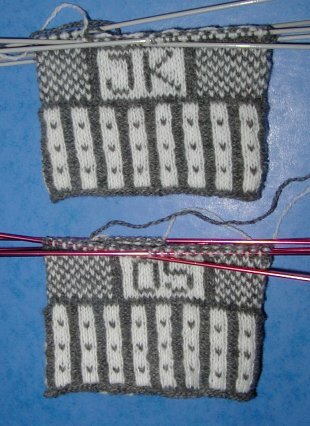 Although I am enjoying knitting these gloves and I do like the way the pattern is developing, I really, really want to knit one of the more famous grid-based Sanquhar patterns like Duke. I couldn’t make them for myself because I’d have had to mess around with the pattern too much to make it fit my narrrow hand, or aim for a gauge of 15 or more sts/in. Fortunately, Rys has volunteered to let me knit him a pair, which with his big hands will only be about 11 sts/in, and he has even promised to wear them if I get the fit right. The speaker at the meeting was Annabelle Spencer of the Falkland Islands Agency in Wells. 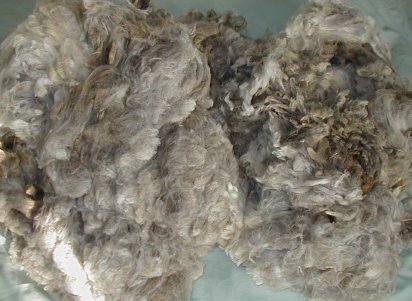 She brought along a good selection of pure Merino fleece from the Falklands, and I couldn’t resist getting a pound of this superfine ‘silver’ which, as you can see, is actually more brownish than the description would suggest. I’m making progress on the gloves. I’m knitting them in parallel to avoid any risk of ‘second glove’ syndrome. I’ve reached the start of the thumb gusset on both, so it seemed a good time to take pictures and give a progress report. It’s getting dark so I had to use fill-in flash, and by the time I realised the “5″ is obscured by the needle it was too late to take more. Yes, I am using unmatched sets of needles. The pink ones are #00s from the Susan Bates sock set (very nice needles) and they are a tad larger than the others, which are 1.75 mm Inox. That doesn’t worry me as I discovered when I measured my hands that my right hand is slightly larger than my left, so if that glove does work up a little looser, that will be a good thing. That discovery started me wondering whether there is any connection between my right hand being dominant and the size difference. It isn’t like having better developed arm muscles on the dominant side due to more exercise, as my hands are very thin and the knuckles (where I measured) are really just skin and bone. 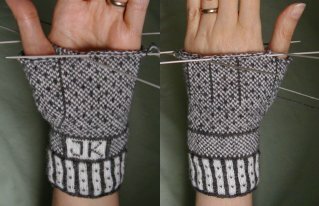 Before I could start these gloves, I had to decide which of the 4 designs from the SWRI patterns I would use, or even whether to use one of the Sanquhar designs described elsewhere such as in Rutt’s book. 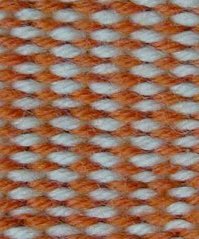 A lot of the most famous Sanquhar designs are based on an 11 x 11 stitch square grid. The SWRI pattern using that square has 99 stitches around the palm, which for my 6.7″ palm would require a gauge of 14-15 sts/inch, which I didn’t want to do. 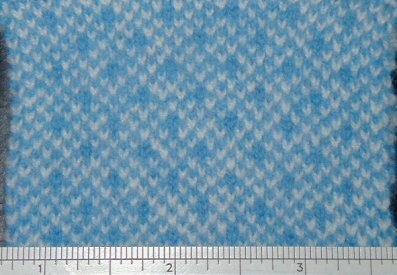 The other patterns have 80 (Shepherd’s Plaid).and 90 (the other 2) stitches, so would work better. Perhaps one day I’ll make a pair for Rys and then I could use one of the grid patterns..
That gave me a gauge of 13 sts/inch, which is what I needed, and I liked the fabric, so I cast on without swatching for the corrugated rib cuff, but fortunately it fits well. 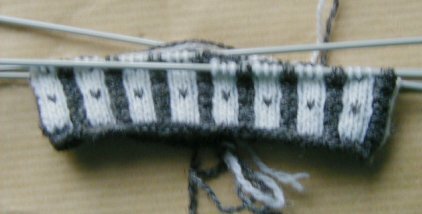 I like the blue and natural swatches, but as you can see I’ve chosen to go with the grey and white yarn which I had already ordered. … just not updating the blog as often as I should. One reason was not wanting the intended recipients of my recent projects to see what I was making. The exchange mittens have reached their home, so I can post pictures of those now. . The recipient requested natural or warm colours, with a preference for orange. Orange is not a colour I would usually use, but I like a challenge. I was going to spin the yarn from BFL/silk, but my dye attempts didn’t work out the way I wanted (though some of the silk turned out really well). 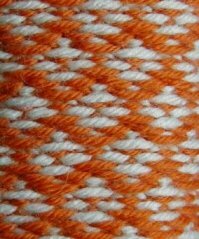 Eventually I decided to buy yarn, but there wasn’t much choice of orange yarn locally. I ended up with Jaeger Baby Merino 4-ply, even though I don’t really like using superwash merino. My first attempt at knitting the mittens was aborted as I found I couldn’t control my gauge with the longer floats (5 stitches) in this yarn, though I’ve done so successfully in the past. 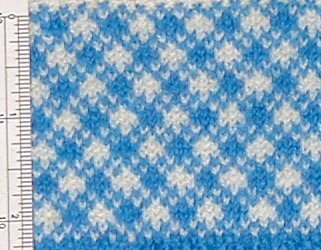 The final pattern was derived by combining elements from various patterns in Folk Mittens and the Mitten Book. 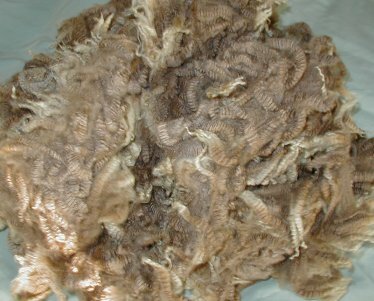 I like the texture the stranding produces on the inside, and all those little air pockets trapping heat. 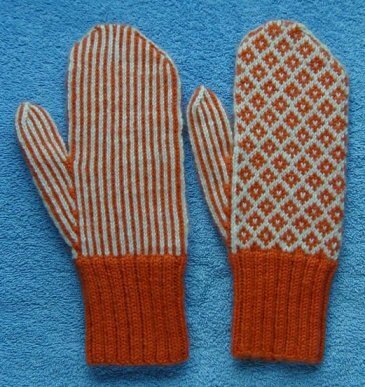 I received lovely thrummed mittens in return. I don’t have pictures yet as Mary intentionally left them slightly large so I could full them to an exact fit. 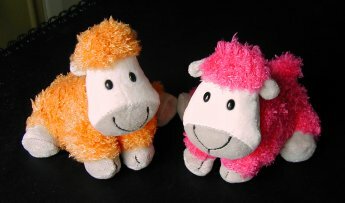 I’ll post pictures eventually, but for now, here is a link to the picture on Mary’s blog (January 26th).